613-591-0006 or fill out this form to reserve. At the Kevin Haime Golf School we have 16 Bays powered by Toptracer Golf's radar tracking systems. Using the same tech used on tour to track ball flight, you can improve your game shot by shot, or bring new fun to practice with 4 game modes and two analysis tools. Launch Pad is our way of making your time at the driving range with friends even better. Using Toptracer Golf tracking as well as a lounge area, turn a regular afternoon of practice into a competition between friends, rivals or anything else. From long drive contests without the 'he said she said' to target practice using the greens and signs you can see in real life, Launch Pad is going to be the ultimate arcade golf experience. Finally settle the score on who can hit the furthest and the range into a long drive grid. Challenge yourself of your friends to a points based game on how close you can get to the targets. 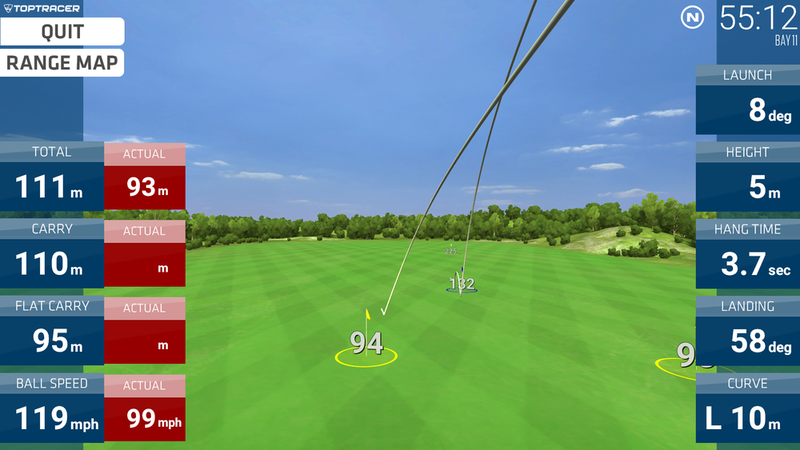 This training mode offers stats like distance, ball speed, height, and more to help you hone your skills. Challenge yourself and your friends to see whose swing is the most accurate, with the ultimate goal of a hole-in-one. Try your hand at playing up to 18 holes on world-renowned courses from your local range. Dig deeper into the details for each type of club in the bag. Plus, connect with the Toptracer community app to store your stats over time. Ready to launch your game to the next level?